To sit with a director and view professionally shot documentary footage is to reexperience the power and glory of cinema, and the promise of developing a dramatic story. Meticulous attention is paid to the composition of each shot; objects withing a frame are brought into or out of focus for dramatic emphasis: color and light are deftly used to accent who or what is speaking to viewers within the frame. Even the movement of the camera is choreographed with seamless dexterity: the shutter opening, perhaps with a shot of a watery sky, panning down in perfect focus to the film's subject in the distance, having what would otherwise by a private moment with a friend in the park; the shot is held steadily in the wide angle just long enough before zoomin in to one person's face, capturing every delicate reaction. Nothing escapes the documentary cameraperson's lens and little is included by an accident. 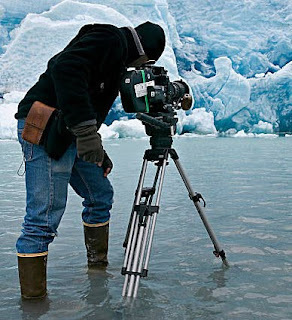 Listening to the nuances of the scenes, and seeking out what will be of interest to the editor - and, eventually, the audience - are the center of the documentary cinematographer's craft. "its about the image", Cinematographer Buddy Squires explains, "But you have to know and sense which image is likely to be the most telling at any given moment. It may well not be the person speaking. It may have nothing to do with the person speaking. I think anybody who doesn't listen has no business working with live humans"
On the Danner Party, he filmed a turning wagon wheel in slow motion and it became a visual metaphor for the exertion and struggle of immigration. On Brooklyn Bridge, Squires took still pictures of the bridge throughout the day, then Ken Burns and editor Amy Stechler used his photographic images as well as time lapse film sequence over Frank Sinatra's vocals as an eloquent transition between the two sections of the film - history and symbolism. Here Squires shares to techniques that he's used on different projects to facilitate visual storytelling. "Recently I've been working with Stephen Ives of Insignia Films on a project he's doing on the history of Las Vegas", Sequires explains, "We were in Las Vegas and Ives was trying to get a sense of the energy of the place and the lights, and how that's all played into the glitz. Of course, we've all seen a million images of Las Vegas"
By photographing the famed Vegas Strip in this way, Squires delivered unusual semi-abstract imagery that appears smudged, colorful and almost ghost-like, "I was using what's really a still photograping tool, which is the long exposure, and then applying that to the motion picture realm. The result was this wonderful, streaky, impressionistic view of Las Vegas - an extended time-lapse. This shot couldn't possibly have been captured in real time, because it was a nonliteral sense of the place, its energy, motion, glitz and lights"
there's often a temptation to use multi camera approach to ensure covering the action well, but most documentary cinematographer differ with this approach. Buddy Squires says: "With a single camera, there is that sense of real time. there's something about the continuity, about continuous action, that's very different than cutting back and forth between camera angles"
Why do we need GREEN TAX?